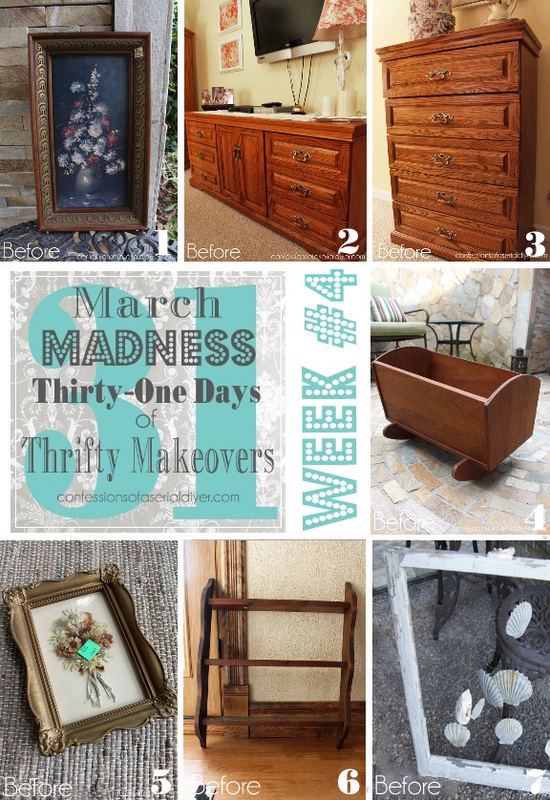 Who’s in the market for a little thrifty makeover today? You’re in luck! 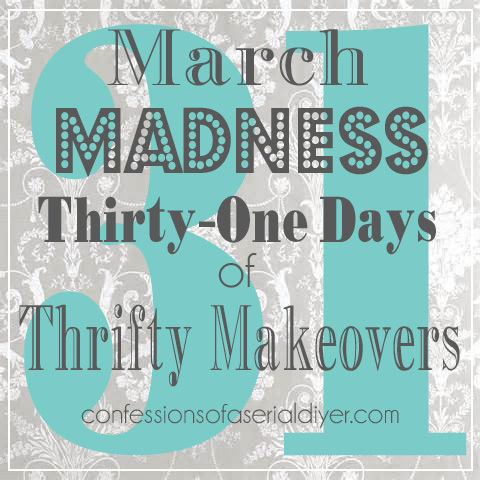 It’s day #29 in this fun March Madness Makeover Series, and I have another one for you! I found this at a thrift store for $49.99 a month ago, and I remember thinking the details on this piece would paint up beautifully. 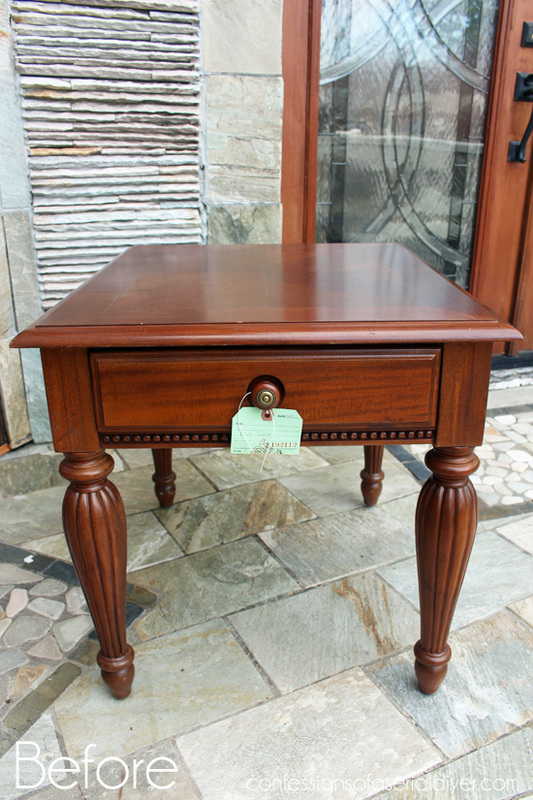 The price was too much though, especially for this cookie cutter furniture store table. The legs screw right off, no dovetails etc. And the top had a few scratches. I stopped back by this past week and it was still there, along with two others I was keeping my eyes on. Since they all had hit the one month-on-the-floor mark , they were all 50% off. But I’m cheap, ya’ll. You know this about me already. So, I approached the gentleman on the floor and told him that I had no business asking for a deal on furniture that was already marked half off, but was there any room to come down a bit more? He scoped out the pieces I was interested in and offered an additional $5 off each piece! See…it never hurts to ask! That saved me $15. I got three tables originally marked at $160 for all three, for $65. Woohoo! I told you those details would be beautiful painted! It’s so soft and pretty now. 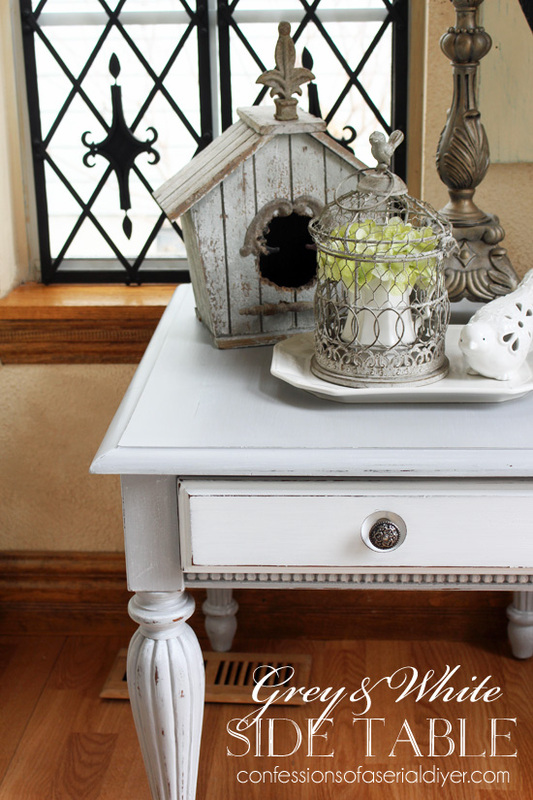 For this piece, I used Sparrow by Behr in my go-to chalk paint recipe. 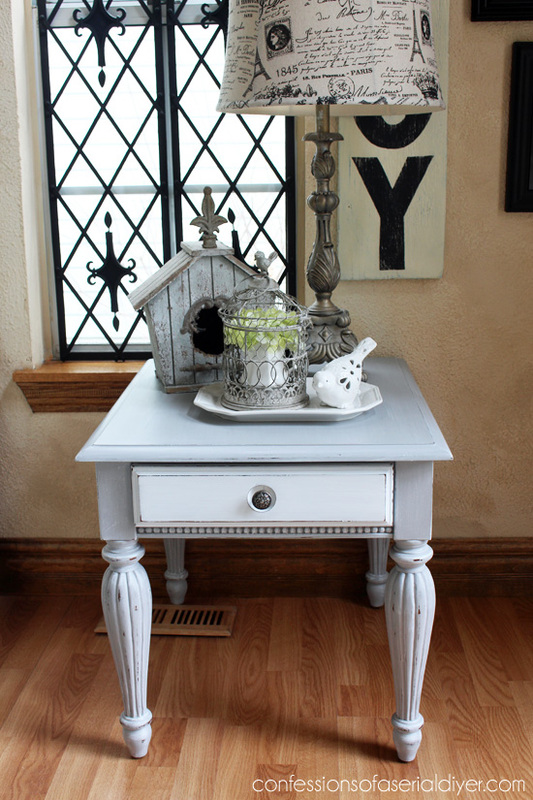 It’s a great match to Annie Sloan’s Paris Grey. It gives the paint a bit more depth than just the flat grey. 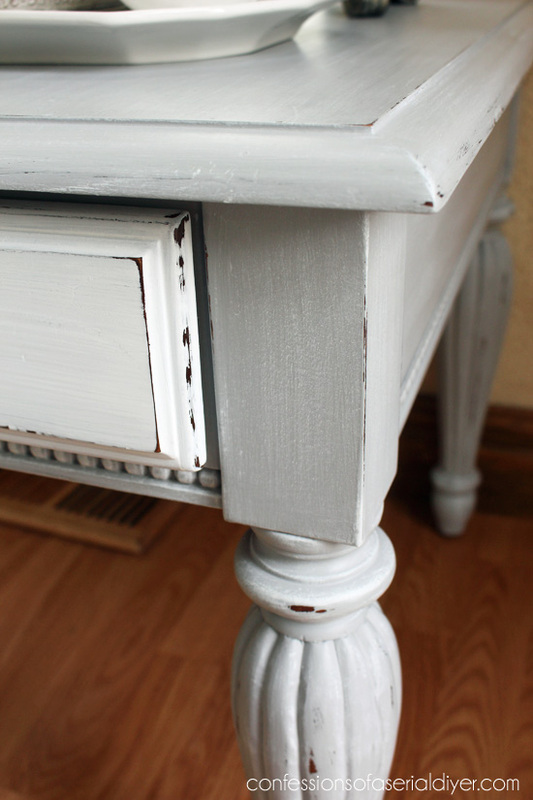 I also decided to paint the drawer white for a bit of contrast. 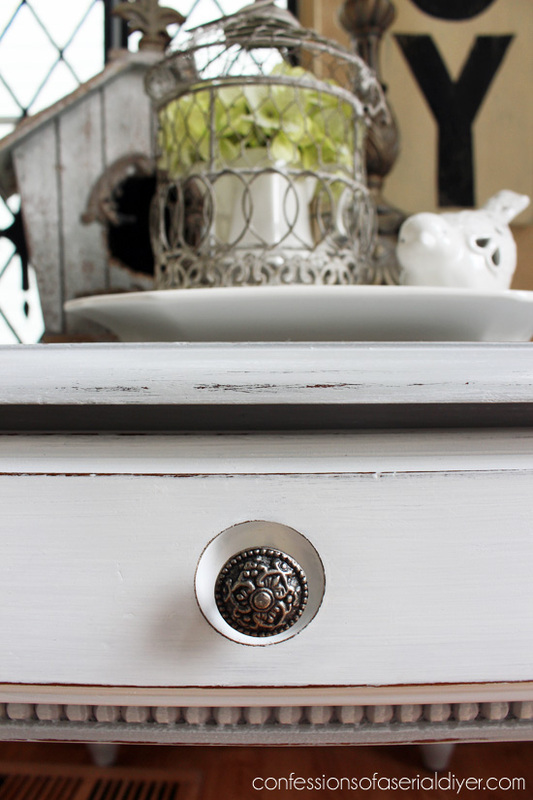 I sealed everything with Annie Sloan clear soft wax. 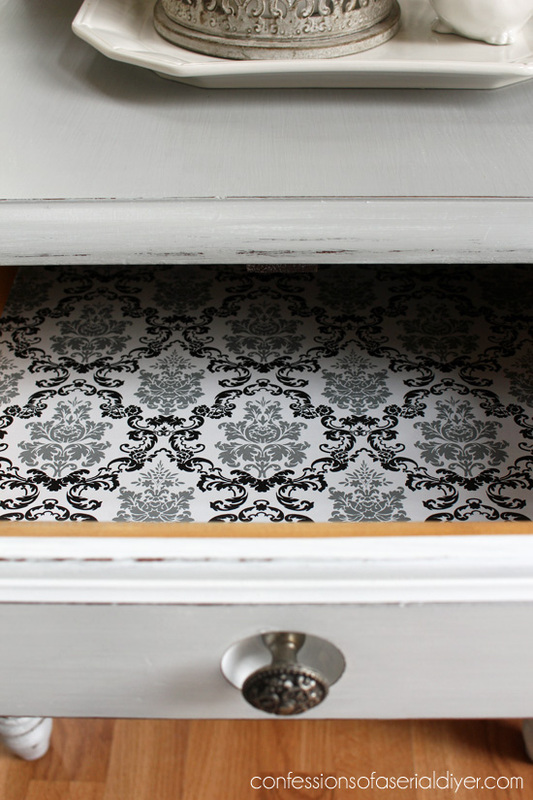 I used a little bit of this pretty drawer liner I had left to line the drawer. 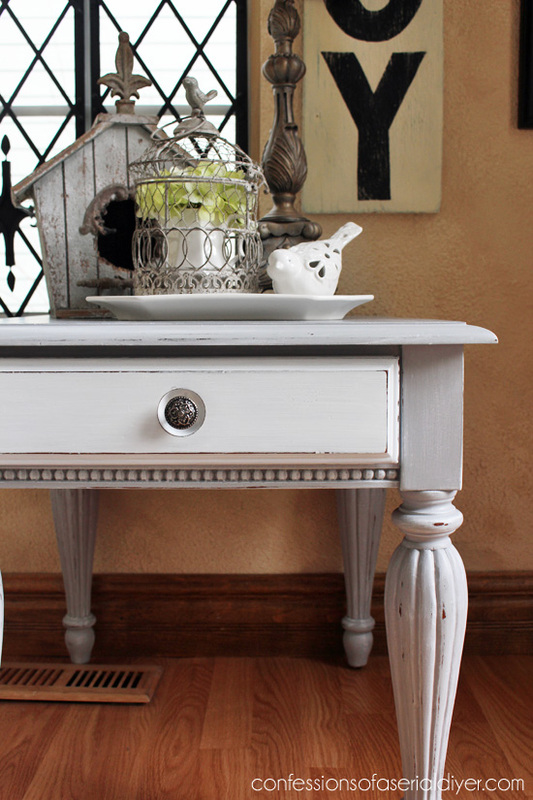 This little table would be perfect sitting alongside a white slip covered chair or sofa! I get a lot of questions about where I got that lamp. The lamp came from a thrift store, but it’s the shade I think people like. The shade came from Tuesday Morning. 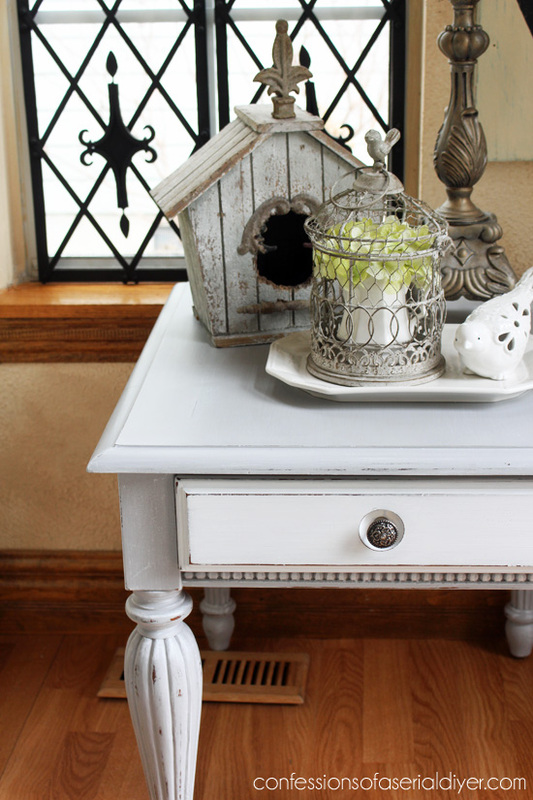 Another table beautifully transformed! I really like the white dry brush look. I am loving your March madness & am hoping you consider May madness? Lol Also Christy, do you have any suggestions for a white wall paint color? There are so many choices. Our daughter wants white for her bedroom or very light green. Do you have a favorite pale green wall color maybe blue undertones? My darling has all white wicker dressers so I am leery of white walls. Thanks for any suggestions. Thanks, Celia! May madness, huh? ha ha probably not, I will definitely consider a Fall version though! As for wall colors, I’m afraid I’m not the expert in either white or pale green. My husband did a tannish tone on tone effect on our walls long before I came in and took over, and I haven’t had the heart to change them. That’s what’s in the background of this table. Good luck, though. 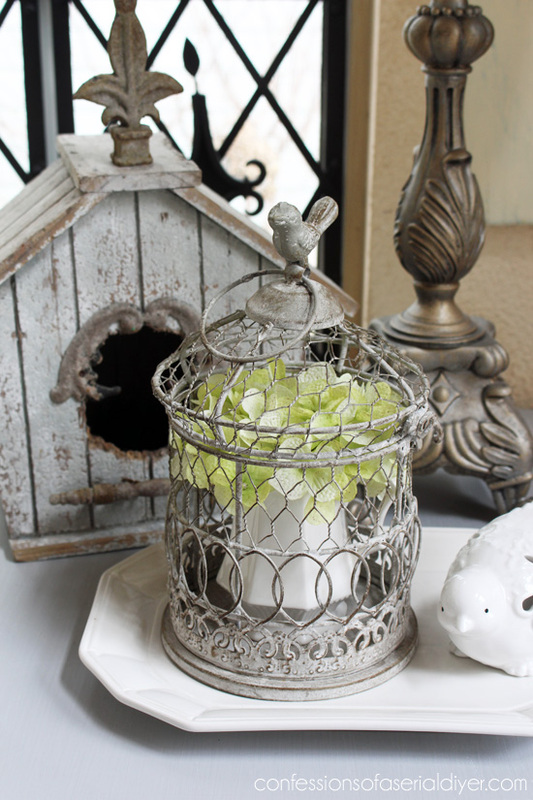 A pretty soft green will be pretty against the white wicker! Christy, you are the best!!! And I love the bird house. 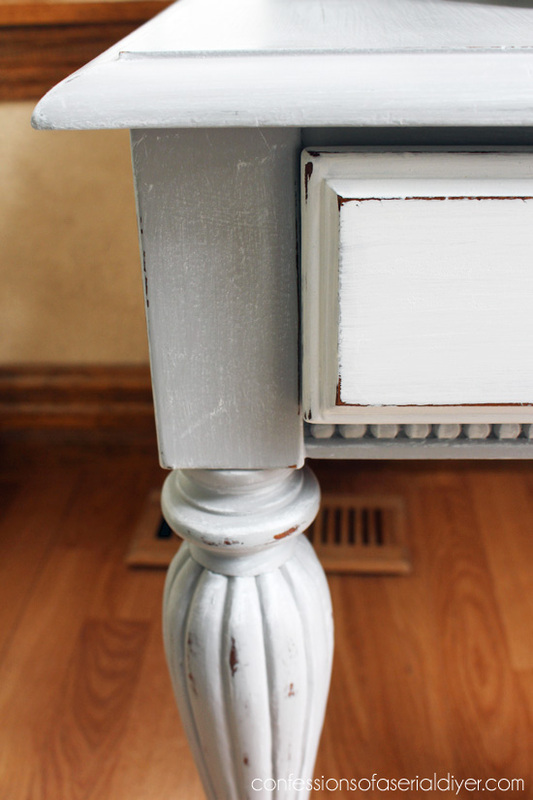 On all of the furniture pieces you update-you never mention if you do or do not sand or prime before you paint-do you do either? Sorry about that, Charles! 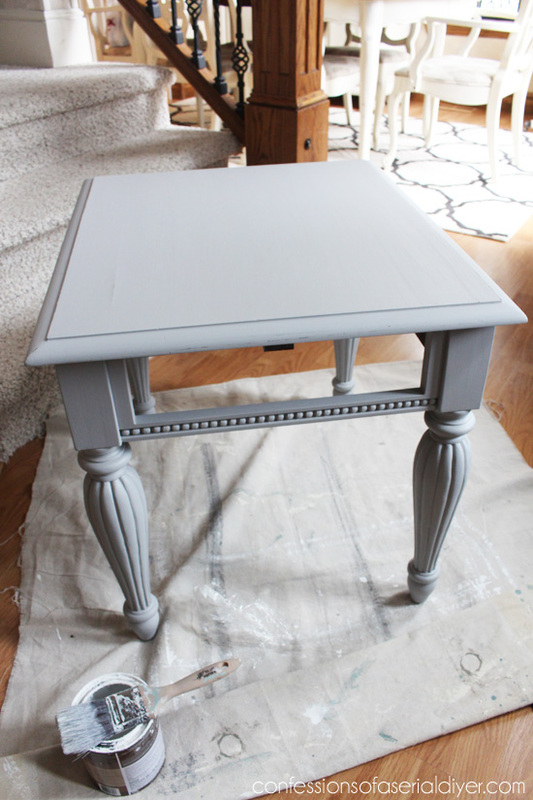 I redo so many furniture pieces that I assume you guys already know the process of chalk paint. 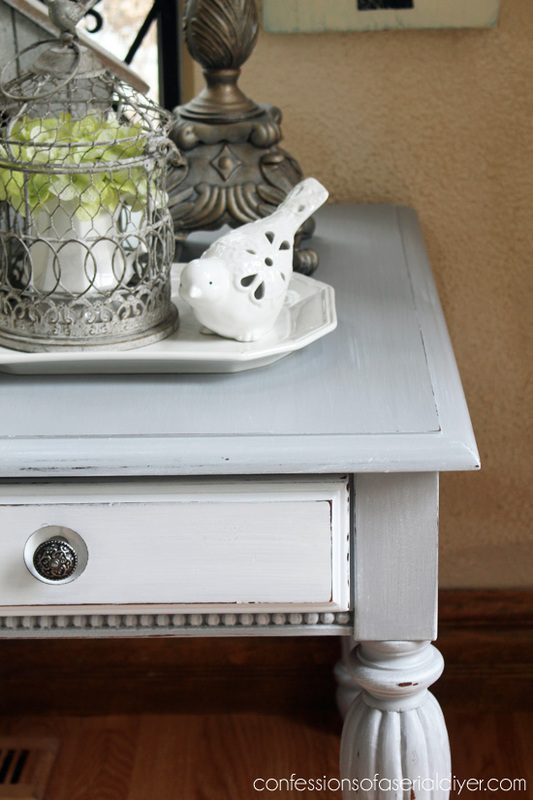 With chalk paint, there is no need to sand or prime first. It adheres to just about any surface. 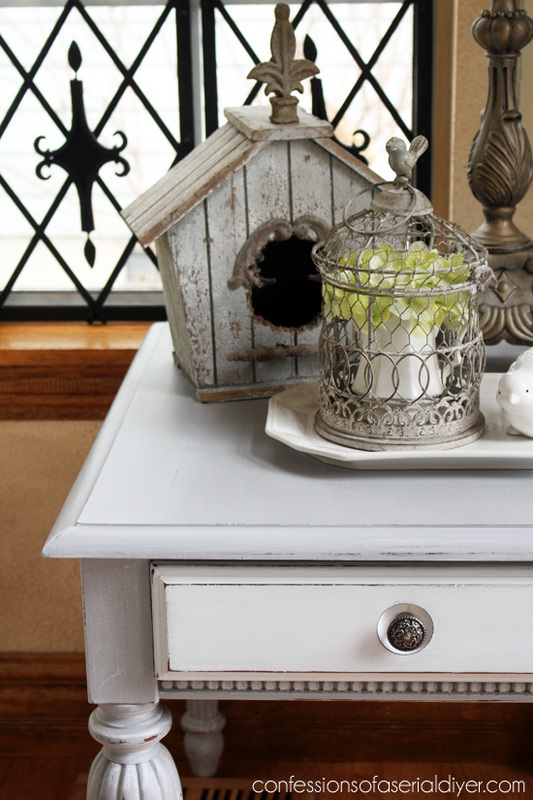 Part of what gives chalk paint it’s adhesion properties is the bonding between it and the wax sealant. 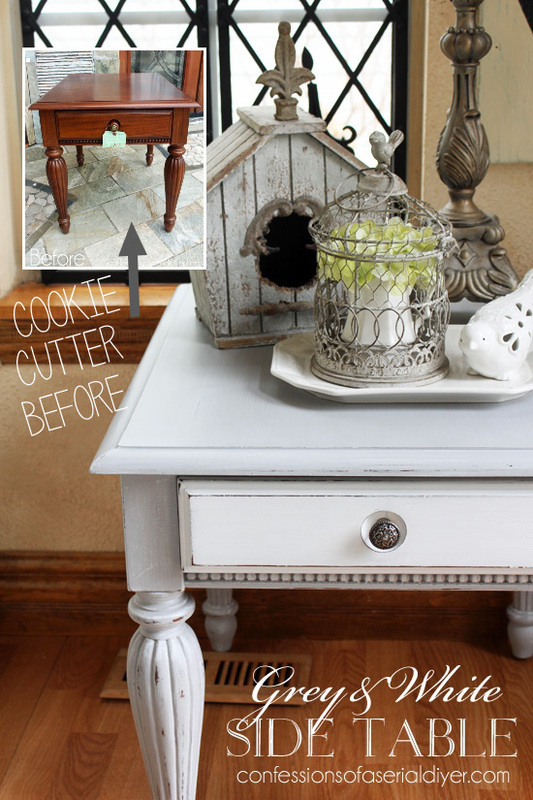 I use Annie Sloan’s clear soft wax to seal and protect. It’s a wax on, wax off, and buff product. Hope this helps! Very pretty Christy – love it! Perseverance pays off…you’re right, it never hurts to ask in a respectful and courteous way. Love the grey. One question from a newbie, can painting be done when temperature is in the 40’s? It is so soft and pretty now – I love it!! I’m really going to be BOARD TO DEATH when March is over! You could turn this entire month in to a VERY successful DIY book. Awww…I love this piece! And I love Tuesday Morning….I could shop there every day. My bank account is glad that I don’t…. I love that place too! I never leave empty handed! This is me . . . Encouraging you to write a book! !